Since Aztec times, Mexico has been a thriving center of commerce. Markets and trade continue to be an intrinsic part of everyday Mexican culture. Shopping hours in Mexico vary by the type of store and the size of the town or city you are in. Generally speaking, Mexican stores offer shoppers extended opening hours and many stores are open on Sundays, too. Note about Parking at Shopping Centers in Mexico: Parking used to be free at supermarkets, but in bigger towns and cities parking is now charged for. Two hours of parking, with a stamped ticket, costs a nominal fee; without a stamp, charges escalate to significant amounts. The charges were introduced to prevent local commuters from parking in the shoppers’ spaces. Out of town shopping centers and those in smaller towns and cities continue to offer free parking for shoppers. Supermarkets: Supermarkets and Hypermarkets are open extended hours seven days a week. Some stay open twenty-four hours a day, depending on the store and the location. During the immediate run-up to Christmas, many supermarkets in Mexico City stay permanently open to deal with the additional demand at that time of year. Shopping Malls: Mexico’s shopping malls typically begin trading daily from 11 a.m. and stay open until 8 p.m. or 9 p.m. Shopping centers with cinema complexes stay open later to let cinema-goers out after the late shows, but most of the stores at these malls close about 9 p.m.
General Stores: General opening hours are from 9 a.m. to 6 p.m. six or seven days a week, depending on the trade. General stores include most of the smaller, independent stores; for example, furniture stores, flower shops, as well as local hardware stores, and other specialist traders (see Local Stores). Pharmacies: Most pharmacies are open extended hours in Mexico: early morning to around 10 p.m. at night. You will always be able to find a pharmacy open 24/7 somewhere in your locality: whether it’s a big city or a town (pharmacies take turns to remain open through the night, to serve emergencies). Local Shops: The small, independently run local shops selling a range of groceries, comestibles, confectionery and basic home goods, tend to be open early and close late. Exact times vary by store and locality, but they are usually open by 7 a.m. and close around 9 p.m. Most of these local stores don’t open on Sundays although a few of them do, especially in bigger towns and in cities. Markets: Local ambulant street market traders start trading at around 10 a.m. and will start to pack their stalls away from about 4 p.m. Some markets stay open late and even keep selling into the night, but they tend to be those selling durable goods and prepared foods—not fresh fruit, vegetables, and meat. If you are shopping for fresh food at your local market, it’s best to get there early for the best selection. Fast Food Outlets: Burger bars and other fast-food joints open early in the morning for breakfast and stay open late into the night. Some are open 24 hours, but most of them close at around 10 p.m. on weeknights and around midnight at weekends. Food Diners: Food diners are popular in Mexico. The main ones are Vips, Toks, Sanborns, and Wings (see Food Diners). They are open early in the morning for breakfast and stay open to around midnight. Some branches are open 24 hours—they have a sign outside advertising this, if they do. Wal-Mart: Wal-Mart entered Mexico in the 1990s, buying-up the Mexican supermarket giant “Aurera.” Like the US, Wal-Mart offers a colossal range of food and non-food goods for sale under one roof. You can still see a store in Mexico called “Bodega Aurera,” which means “Aurera Warehouse,” offering discounted comestibles and home wares in a no-frills shopping environment. Soriana: Soriana is a supermarket group based in Monterrey which had a limited presence in the Mexican supermarket scene until its acquisition of a large chain of stores known as Gigante and further acquisition of the Commercial Mexicana. With these acquisitions, Soriana has become a major supermarket group in Mexico. Chedraui: Chedraui is one of the smaller supermarket groups in Mexico. Until recently, their stores were confined to the southeast and south of Mexico. However, when the French supermarket group, Carrefour, decided to exit Mexico they sold their thirty-or-so stores to this group; the stores have been switched over to the Chedraui name. CostCo: CostCo is a members-only warehouse store, selling an extensive range of food and non-food items, sometimes in bulk, at competitive prices. You buy a Membership Card and then you get entry to the store. CostCo offers everything from comestibles to TVs and Personal Computers; you can also buy stationery, office equipment, books, clothes, toys and games, home electrical appliances, photography equipment (they also have a photo lab where you can print digital photos), an opticians, and even sell goods like table lamps and fire-proof safes. In addition to the big supermarkets, Mexico offers a wide range of alternative places to buy fresh food, including local stores and markets of the kind which have largely disappeared from the U.S. retail sector. Note for People with Food Allergies: If you or your child suffers some kind of food allergy, Mexican supermarkets now offer ranges of diary-free, gluten-free, wheat-free and egg-free foods to choose from, and some are quite widely available. For example, lactose-free milk, known in Mexico as leche deslactosada, is available in convenience stores, pharmacies, supermarkets—even coffee shops and diners now offer it as standard. You can also find soy milk and rice milk in the bigger supermarket chains. Other foods suitable for people with allergies are becoming more common at supermarkets; they are usually clustered together on an aisle or on a sales island in the store: ask an assistant for help and direction. The abundance and affordability of fresh fruit, vegetables, and other fresh foods in Mexico make it quite simple to enjoy a healthy, balanced and nutritious diet when you buy the fresh raw ingredients to create your meals. Fresh Food Markets in Mexico: Food markets may be seen everywhere in Mexico and, chances are, there is one near you at least one day a week. Ask locally to find out where your nearest market is. Fresh food markets in Mexico are presented in two formats: the ambulant market stalls, which move from place to place within a town, setting-up their stalls in defined areas on a weekly basis; and covered markets, with fixed market stalls inside an open-plan stone building, open at least six days a week. Local Shops: Small, local corner shops sometimes offer a limited selection of fresh fruit, vegetables, and sometimes cheeses and cured meats, including hams (see Local Stores). Central de Abastos: The Central de Abastos, based in the Iztapalapa area of Mexico City, is one of the world’s largest fresh food markets. All of the top chefs in Mexico’s fine restaurants go there in the morning to select the fresh produce they will serve at their establishments. If you live within easy reach of this, it’s a great place to buy your food (and a shopping experience in itself); however, most of the fresh produce you buy at your local market probably comes via the Central de Abastos, anyway. The local store types listed above stock and sell comestibles. There are many other types of local stores, you can see the complete list under Local Stores in Mexico, on this guide. See also Local Markets in Mexico. Liquor Stores: Although some are looking dated, liquor stores selling nothing other than beer, wines, and spirits—continue to do a brisk trade in towns and cities across Mexico. They are open late (often into the early hours) and some are open 24/7. Tobacco Stores: Cuban cigars are popular in Mexico and may be purchased freely. Most fine cigars are sold by specialist tobacco stores which may be sought in the downtown areas of big towns and cities. Mexico City’s airport also has a tobacco store selling cigars. Sanborns stores nation-wide have a tobacco counter, offering an ample range of cigarettes and fine cigars, including Cuban cigars. Local Stores: Some local stores sell a limited range of beers and liquors and most also sell cigarettes. Some smaller stores are also beginning to stock a small selection of wine. Convenience stores (like Seven-Eleven, Circle K, OXXO) sell cigarettes, beer and wine, and some also stock limited range of liquor. Local Markets: You’ll always find at least a few stalls at a Mexican market selling a range of clothes and clothes accessories (belts, ‘bling’, etc). Both ambulant and fixed markets may have clothes (and shoes) for sale at some of the stalls. These markets are popular with younger Mexicans looking for certain fashion items and the value-savvy shoppers seeking out interesting clothes at attractive prices. Traders at some of these markets offer hand-made artisan clothes produced in Mexico; the quality varies but they offer a genuine alternative to mass-produced factory clothing, usually imported from far-eastern countries. Designer labels on clothes sold at market stalls may or may not be genuine. Supermarkets: Supermarkets are one of the more popular places for people buying no-frills, everyday clothing in Mexico. Wal-Mart, Soriana, CostCo and others offer sections where you can buy clothes and they’re the ideal place to find a swim suit or other casual wear if you forgot yours when you’re traveling or on vacation. Department Stores: Department stores like Liverpool, Palacio de Hierro and Sears (see Department Stores, below) have extensive clothing ranges in their stores, including designer brands imported from the USA and Europe. Shopping Mall Boutiques: Clothes boutiques based in most shopping malls offer affordable ’boutique’ quality clothing. There are specialist men’s and women’s stores, for example, Scappino for men and Zara for women. They also feature most of the US-branded American clothing outlets. Specialist Boutiques: Up-scale boutiques, particularly in Mexico City, offer the latest fashions, usually imported from the US and Europe. Areas in Mexico City like Alta Vista, Polanco, Condesa and Santa Fe are the places to visit to find the latest in clothes fashion trends (and the highest prices). Hand Made Furniture in Mexico: Specialist markets and some towns and villages in Mexico offer you the opportunity to have your home furniture made to measure with locally produced woods and other local materials. For example, Tlaquepaque near the city of Guadalajara has a number of boutiques offering restored and ‘chic’ furniture and furnishings. Sometimes you will find furniture being offered for sale at road-side stalls and markets; prices and quality and vary: for example, some pieces may be in a ‘raw’ state and require sanding, varnishing, or painting before they can be placed in your home; others may be ready for your immediate use. You’ll need to be able to speak Spanish to negotiate with the local sellers, and you also need to know what to look for (and look out for) when buying, as the craftsmanship varies tremendously. Artisan furniture crafted to high standards is available in Mexico through furniture boutiques as well as specialized traders. Department Stores: Department stores in Mexico have their own furniture and furnishing departments; they are ideal when you want to buy something like a quality mattress and other modern furnishing comforts for your home. They will deliver items you see in-store to an address in Mexico, usually within a week, although some lines may have longer delivery time scales. See Department Stores. Specialist Furniture and Home Wares Stores : There are two chain-stores in Mexico which have branches in a number of towns and cities nation-wide: Coppel (formerly Viana), and Elektra . Each sell a wide range of quality furnishings and home wares, including furniture for all rooms in the house, home entertainment, and electrical appliances for the kitchen and laundry. You will never be very far away from a pharmacy in Mexico. Notwithstanding this, a number of outlets, other than pharmacies, sell prescription drugs in Mexico, and pharmacies themselves sell a lot of other things besides medicines. Pharmacies: Every town has at least one (and usually several) pharmacies with at least one of those open 24/7. All cities have at least one pharmacy in the locale where you live. Before the days of supermarkets and convenience stores, pharmacies in Mexico were important stores which supplied a number of sought-after products other than medicines: the most common were soaps, shampoos, creams, make-up and and other items associated with personal hygiene. They also sold ice-cream and confectionery, sodas, and some even stocked a range of simple toys and board games. Today you will find some pharmacies still selling these items, although most have substituted the obscure goods for items such as vitamin supplements, diabetes testing kits, contact lenses, bottled water, and other modern ‘healthcare fashion’ items. Look for the word Farmacia; some have more elaborate titles like Farmacia Familiar or Farmacia de Descuento. Farmacias Similares is a franchise offering low-cost generic (no brand) drugs. Also read about pharmacies and medications on the Mexperience guide to Health and Healthcare in Mexico. Supermarkets: All supermarkets have a pharmacy offering a range of traditional over-the-counter medicines like cold remedies and aspirin, as well as prescription-only drugs. The range of medicines, especially prescription medicines, on offer at a supermarket may not be as extensive as that offered in a traditional pharmacy outlet. Sanborns: All of Sanborns retail stores have a pharmacy counter. The range of specialist medicines may not be as extensive as a traditional pharmacy, but they do stock a wide range of complimentary items, including goods for personal hygiene and popular healthcare equipment and accessories, e.g. heart-rate monitors, pedometers, etc. Markets: Market stalls, both in ambulant markets and fixed (covered) markets, usually have a stall selling sports shoes and a range of fashionable sportswear. Department Stores: Department Stores have extensive sportswear and sports equipment sections, usually divided into three main areas: sportswear (clothes and fashion wear); sports shoes (tennis shoes, soccer boots, etc. ); and equipment (running and cycle machines, weights, home gyms, etc). Specialist Sports Stores: The most well-known specialist sports store in Mexico is Marti. Marti has branches in towns and cities across Mexico and the larger outlets are sports-fan emporiums, even offering specialist sports equipment like skis and mountain climbing equipment. Besides Marti, other specialist sports stores in Mexico include Sportland, and Ruben’s. Online sports catalogs can be found at SportsOnline (Mexico) and ForumSport. Most newspapers and magazines in Mexico are sold at street corner news-stands. Some Supermarkets sell a (limited) range of magazines, usually lifestyle, computing and sports magazines. Sanborns stores stock a wide range of magazines in both Spanish and English, including the international versions of global magazines like Time, Newsweek, Business Week, Fortune and The Economist. You can also buy newspapers and magazines at bus stations (principally Spanish language material) and Airports (Spanish and English material). One of the biggest attractions for foreign shoppers in Mexico is the absolutely enormous range of local markets available here. Markets in Mexico go back to Aztec times. Ambulant Vendors: Walking the streets, jockeying between cars at the stop lights, riding the Metro (in Mexico City), stopping at street tables next to coffee-houses, boarding buses… indeed, anywhere people may be, you will find ambulant vendors in Mexico. Ambulant vendors don’t have a market stall; instead they usually carry a satchel holding the goods they sell—exactly what that is may be anything. Common items are pens, confectionery and other small, easily portable items. The goods they offer are usually sold the lowest-price you’ll get for that item anywhere. Local Ambulant Food Markets: Ambulant food markets usually set up once or twice a week in the same spot—ask locally for details in your neighborhood. Look for the distinctive pink-topped canvases. 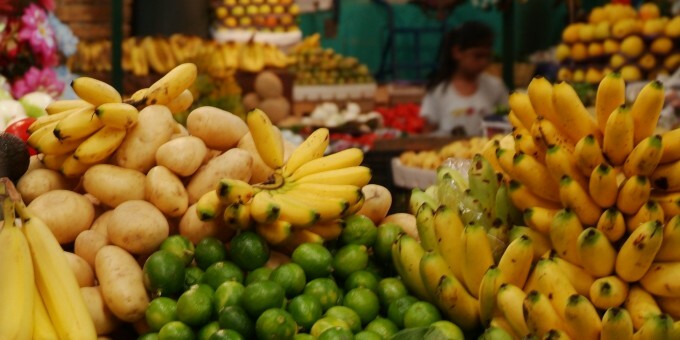 They offer a wide range of fresh fruits, vegetables, meats, poultry, fish and spices. The food sold at these markets is fresh daily. Local Food Markets: Situated in open-plan stone buildings, these are fixed market stalls similar to supermarket islands, but each trader is a separate business selling specific types of food. These markets sometimes feature purveyors of exotic meats as well as a wide range of local (sometimes national) spices and chiles. Ask locally for the nearest market buildings near your home. Cooked Food Markets: Street food is available everywhere in Mexico. Sometimes it’s sold on a single stall or two situated on a street corner; sometimes a whole market will be dedicated to selling cooked food: a sort of ambulant restaurant. Street food is inexpensive and can smell great, but beware if you are not used to eating it: see Healthcare in Mexico: General Precautions for more details. Spices and Chiles: One of secrets behind the wonderful taste of Mexican food is the colossal range of spices and chiles that are grown, harvested and ground here. Some markets specialize in spices or, at least, have a spice stalls section. Art and Craft Markets: Most non-food markets sell a wide range of Mexican art and craft work. Some markets are specifically set up to sell locally made arts and crafts; this is particularly common in Mexico’s colonial towns and cities. Others markets bring in the arts and crafts from around the region or, even, from across the whole country; the latter is especially common at art markets in Mexico City, which attempt to offer capital dwellers a wide choice of art from all of Mexico. Clothes and Shoes Markets: Some markets feature (predominantly) clothes and shoes, and clothing accessories. Clothes may be imported from the far east, and some of the designer label clothes being sold may or may not be genuine. Clothing accessories, especially those made from leather and iron (e.g. belts and buckles) may be made in Mexico—ask the trader. Books and Magazines: Some markets specialize in selling second hand books, vintage magazines, and old posters and photographs depicting scenes of Mexico at the turn of the 20th Century. Local stores are part of the suburban fabric in Mexico, because people still shop at their local stores instead of doing all of their shopping at big supermarkets. In bigger towns and cities, small stores can be vital, because getting to the supermarket may mean an hour’s journey across town and traffic. In smaller towns and villages, the local stores may be the only place you can buy comestibles and other home goods. Traditional Local Corner Stores: The local ‘corner’ store in Mexico (known as “la tiendita“, or ‘little shop’) is most usually family-run, and open extended hours (e.g. 7 a.m. to 10 p.m.), and stocks a range of dry food goods, day-to-day home-ware and personal hygiene items, confectionery, potato chips and peanuts, sweet cakes and rolls, sliced bread, some cured meats, cheese, milk, creams and yogurt, sodas, bottled water, and a small range of basic fresh vegetables and fruits. Some of the larger local stores of this type also sell some ice-creams and basic pharmaceuticals. Papelería or Recaudería – stationery and office supplies including photocopies, fax, etc. See Also: Buying Food in Mexico and Local Markets in Mexico, on this guide. Franchise Local Convenience Stores: US-style convenience stores (some open 24-hours) have arrived in Mexico: OXXO is the most common, you will see this franchise nation-wide; you can also find Seven-Eleven and Circle K stores in Mexico. They sell a wide range of every-day goods and some also sell hot snacks and filter coffee to take away. Department stores are extremely popular in Mexico. Most of the department stores have branches in major towns and cities across Mexico. Coffee shops have been popular in Mexico for decades; the recent surge in popularity of ‘chic’ coffee shops has brought Starbucks and others to Mexico as well. Local, Independent Coffee Shops: Notwithstanding the break-neck pace of Starbuck’s expansion in Mexico, local independent coffee shops remain well frequented by locals. Look around your neighborhood or office and you’ll find several independent coffee houses; each unique, each serving excellent coffee, probably made from beans which grew in the state of Veracruz (on Mexico’s Gulf coast) or Chiapas (the southern highlands of Mexico): places from where Mexico’s finest coffee beans emanate. There are four ‘big name’ food diners in Mexico as well as a plethora of small, independent, food diners selling ‘comida corrida‘ (food on the run); the latter is usually a set menu for a fixed price, popular with office workers. If you reside in Mexico, you will probably, sooner or later, go shopping in the USA. Many Mexicans who can afford to, go to the US on shopping trips during the course of the year. Not too many years ago, the reason for going abroad to shop was that Mexico’s stores lacked choice and variety due to strict import regulations; today, people go to the USA to shop because prices for identical goods are cheaper—sometimes a lot cheaper—than the same thing purchased in Mexico City. Price differences of durable and technological goods have narrowed in recent years, but the gap can still be significant for certain items. The USA has such a competitive and efficient market that prices of goods there are lower than most other countries world-wide, not just Mexico. There is a US$300 tax exemption on items you import (in addition to those already listed above) when you enter the country by means or air or maritime transport; the exemption is reduced to US$50 if you travel in by land, except at Easter, Summer Holidays and Christmas time, when the land exemption limit is increased to US$300. When you arrive at an international airport, you will be asked to declare any items beyond the exemptions or face a fine (in addition to the tax pay-able) if you are subsequently given spot-check and caught importing more than you are allowed to. All baggage arriving via international airports is passed through an X-ray machines at customs, after you collect it from the airline and before you are allowed to exit the customs area. If you are arriving by land and you go past the 35km ‘free’ zone, your vehicle will probably be searched at the check point, casually or thoroughly. See Also: The Mexperience Mexico Essentials Guide to Mexico Entry Requirements for more information about rules and procedures at ports of entry.